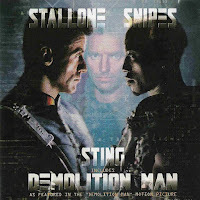 Demolition Man is an EP released by Sting on September 21, 1993 (US) and November 1, 1993 (UK) in support of the Sylvester Stallone/Wesley Snipes film Demolition Man. It features a re-recording of the Police song "Demolition Man" that was not well-received by critics, as well as live recordings of several Sting compositions from Ten Summoner's Tales and other albums. The live recordings were recorded live at Villa Manin, Codroipo, Italy on 25 July 1993. The US and International/European EP release features the title track and five live recordings and sales for this release were listed on the US Albums Chart, as the UK release was a standard single which featured an exclusive single version of the title track as well as the album version and two live recordings. The UK release charted therefore on the UK Singles Chart, where it peaked at number 21. Demolition Man is a 1993 American dystopian, science fiction action film directed by Marco Brambilla, and starring Sylvester Stallone and Wesley Snipes. Sandra Bullock, Nigel Hawthorne, and Denis Leary co-star. The theme song to the film is titled "Demolition Man" and is played over the end credits. It is a remix (heavier version) of the song originally written by Sting and recorded during his time as frontman for The Police. The song was first released in 1981, as the fifth track on the band's fourth album, Ghost in the Machine. Sting released an EP featuring this song and other live tracks, entitled Demolition Man.